Monkey nuts is pretty much a fancy name for peanuts on OSRS. It was released back in December 2004 and its function is to heal 4 hitpoints. Another use for Monkey nuts is in farming, where 5 of them along with a Monkey bar and a ground Suqah tooth serve as payment for protection of a spirit tree. 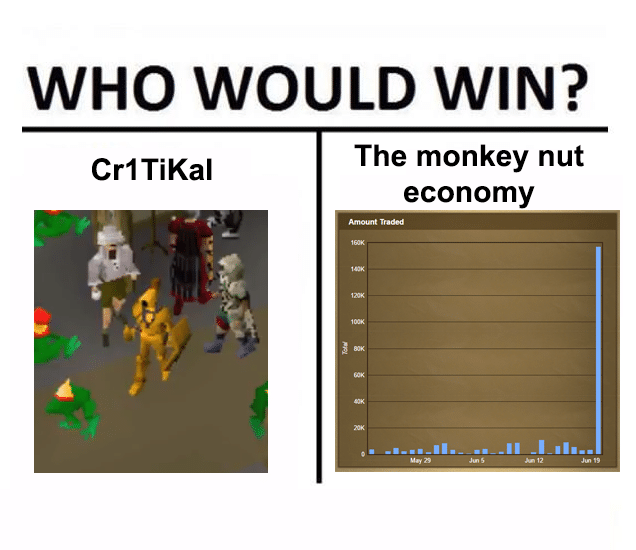 How do we get Monkey nuts osrs? You have start the Monkey Madness I quest and then you can purchase them at the Solihib’s Food Stall on Ape Atoll. A funny thing about monkey nuts is that in order to talk to the stall owner and get them you have to be in the form of a monkey. This can be easily done by holding a monkey greegree. If the player tries to talk to the owner without transforming first, they will be thrown in jail exactly like in the quest. You can also find a Monkey nut bush under the Ape Atoll agility course, but for whatever reason there are never any nuts on it. The bush only grows Tchiki monkey nuts which are used only during the Freeing King Awowogei subquest on Recipe of Disaster. Why is Monkey nuts’ price rising? Monkey nuts sound like nothing much, right? Then how come its price keeps rocketing over the top? The answer is related to a popular Youtuber known as penguinzO or Cr1TiKaL. He’s a passionate OSRS streamer and is known for collecting obsessively Monkey nuts and saving them as an in-game currency. PenguinzO supposedly owns over 1.2 million Monkey nuts which is pretty much a shocking number. He shares in a video that “whoever controls Monkey nuts is the one who controls RuneScape”. Big words huh? In June 2017 he asked his subscribers to donate him Monkey nuts and the sudden & absolutely shocking rising of their price was due to people buying huge amounts of Monkey nuts for him. At some point the price went up from about 300 coins to over 10k for one item! One might say he really “busted the nut”! Prices of Monkey nuts have been significantly lower since that economic explosion back in 2017 but they go through constant periods of rise and fall. The price has increased double in the middle of January 2018 but today they are down to a very low price of 292 coins for one. So go buy some cheap OSRS gold while prices are still down and stock up on Monkey nuts! This entry was posted in How-To Tips & Tricks, Latest OSRS News, Old School RuneScape, OSRS Mobile App and tagged buy OSRS gold, buy osrs items, cheap OSRS gold, monkey nuts osrs, monkey nuts runescape, OSRS gold, osrs money making, osrs money making 2019. Bookmark the permalink.